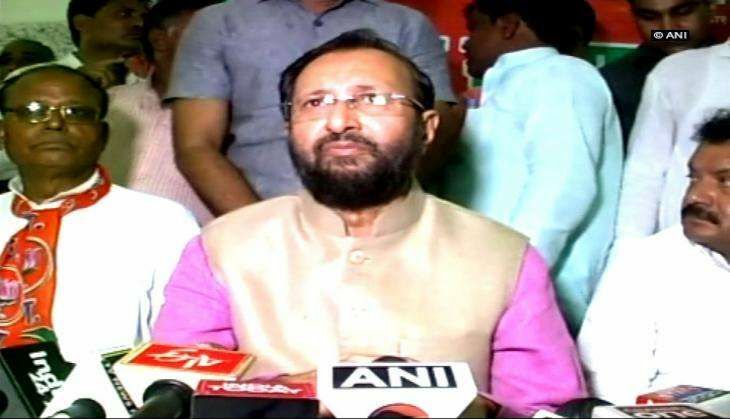 Minister of State for Environment and Forests, Prakash Javadekar, on Thursday countered his Cabinet colleague Maneka Gandhi's charges that the Environment Ministry thrived on killing innocent animals and asserted that such decisions were taken keeping scientific facts in mind to help those affected by such animals. "I will not react on who said what. But as per the law, we must help farmers whose crops get ruined. The state government sends us a proposal and only then we initiate a step for a specific region and for a specific period of time keeping scientific facts in mind," he told the media here. Defending the Centre, Javadekar stated that taking such a decision was not the Centre's prerogative, adding that the Environment Ministry acted as per the law. Maneka Gandhi, who is the Union Minister for Women and Child Development, earlier in the day trained guns at the Environment Ministry while accusing it of frivolously granting permission to kill innocent animals. Commenting on reports of a large number of deer being killed in Bihar's Patna city, Gandhi told ANI that she does not understand this "lust" to kill. "The Environment Ministry here is writing to every state asking them which animal they want to kill and they will grant permission. In Bengal, they gave permission to kill elephants. In Himachal, they gave permission to kill monkeys. In Goa, they gave permission to kill peacocks," said Gandhi. According to reports, the Union Government has recently declared monkeys as 'vermin' and cleared the decks for their large-scale extermination in Himachal Pradesh's Shimla city. Meanwhile, a call was made in Goa to cull India's national bird peacock, citing that the bird is creating a problem for farmers and destroying their cultivation in rural areas. Similarly, the local forest department in Maharashtra culled a whopping 300 animals in the past few months after several farmers reported huge losses due to crop raids.